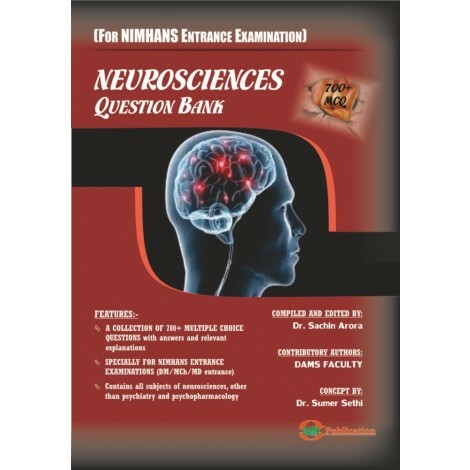 This book is targeted to provide MCQ’s for practice to young medical graduates aspiring for a post-graduation seat in NIMHANS. Although a number of books regarding this subject are already available, but this book is a combination of what the type of book need I felt during my own preparation, and while answering queries of students, I realised about the discrepancies in answers. 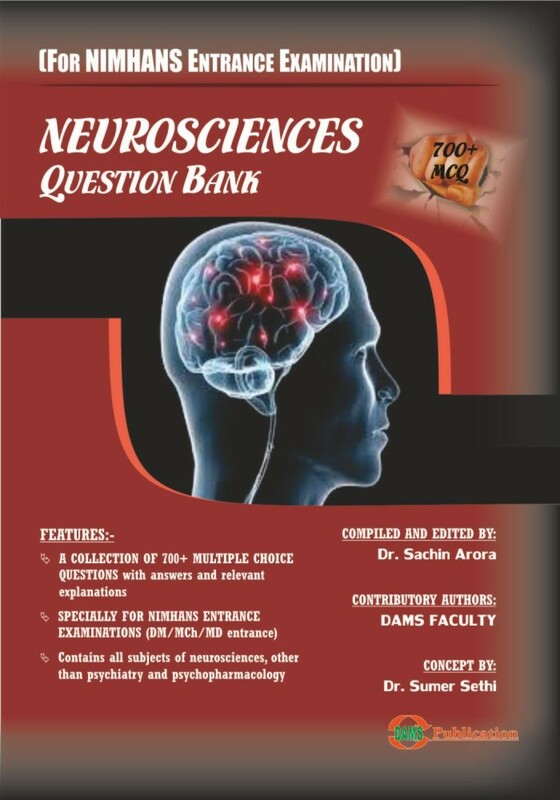 Moreover, it was my students who motivated me to write this book after appreciations and feedbacks of my previous title “Psychiatry Question Bank 2.0” which covered psychiatry and psychopharmacology section of neurosciences. 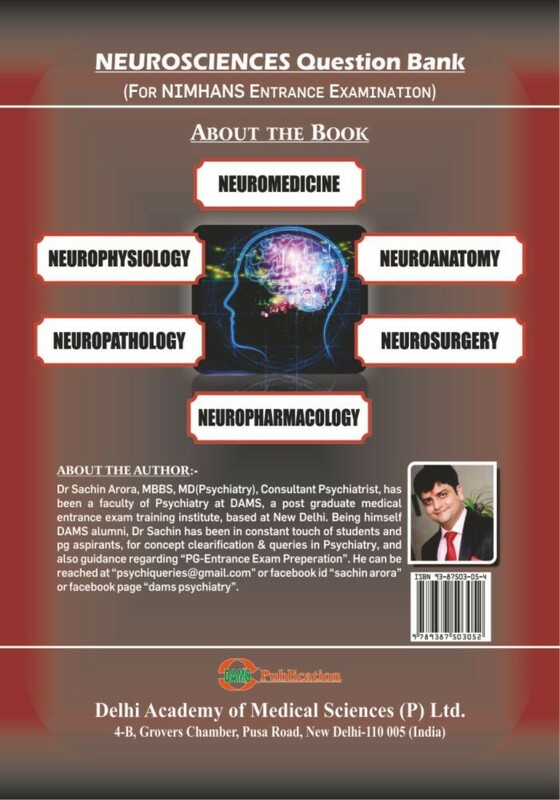 In this book, there are total 8 sections of neurosciences (TOTAL 700+ MCQ) containing questions related to neurosciences, covering all major and minor areas asked and they are edited by individual subject experts in their fields: Dr. Rahul Nikumbhe, MD (Neuromedicine), Dr. Sandeep Madaan, MD (Neuroanatomy), Dr. Deeksha Sikri, DNB (Neuropathology), Dr. Reena Kaur, MD (Neurophysiology), Dr. Manish Chhabra, MS (Neurophthalmology), Dr. Souvik Singha, MCh (Neurosurgery), Dr. Sumer K. Sethi, MD (Neuroradiology), The questions in this question bank are based on the recall of students and some new questions. Authors and publisher have compiled them to the best of their knowledge and expertise in selection of the question and its answer. Dr Sachin Arora, MBBS, MD(Psychiatry), Consultant Psychiatrist, has been a faculty of Psychiatry at DAMS, a post graduate medical entrance exam training institute, based at New Delhi. Being himself DAMS alumni, Dr Sachin has been in constant touch of students and pg aspirants, for concept clearification & queries in Psychiatry, and also guidance regarding “PG-Entrance Exam Preperation”. He can be reached at psychiqueries@gmail.com” or facebook id “Sachin arora” or facebook page “dams psychiatry”.